Scientists at the Large Hadron Collider in Switzerland have discovered an exciting new particle—or rather, an exciting combination of particles. It doesn’t have quite the same impact that the Higgs Boson (the one people called the God Particle) did five years ago. But it does have people talking, and many folks are thinking about a controversial set of results from an older experiment. The particle in question is an arrangement of three quarks called the Ξcc++ or the “doubly charged, doubly charmed xi particle” in English, discovered by the LHC’s LHCb detector. You may remember that the nucleus of an atom consists of protons and neutrons. Protons have two up quarks and a down quark, and one unit of positive electric charge. Neutrons have an up quark and two down quarks, and their charge is zero. The new xi particle consists of an up quark and two of a very heavy flavor of quark, called the charm quark, and its charge equals two. “We produce charm quarks in pairs, but having two charm quarks in the same particle is very rare,” physicist Patrick Koppenburg from Nikhef, the Dutch National Institute for Subatomic Physics, told Gizmodo. The charm quark makes up one of six possible quarks, including the up, down, charm, strange, top and bottom. The heaviest are the charm, bottom [also called beauty] and top [also called truth], but the top is probably too heavy to arrange with other quarks, he said. The other quarks should theoretically be able to arrange into groups of two, three, four or five, or even into a sort of quark liquid if things get hot enough. In a sense, said Koppenburg, because there’s a contested result from as early as 2002, when the SELEX collaboration at Fermilab in Illinois announced that they’d found a related particle called the Ξcc+, the singly-charged, doubly charmed xi particle (that’s one plus sign instead of two). That particle also has two charm quarks, but has a down quark instead of an up quark like the new xi from LHCb. The one plus sign-xi also has an elemental charge of one, like a proton. Koppenburg said that several other experiments have failed to reproduce SELEX’s particle. And this new particle casts further doubt on the SELEX discovery. 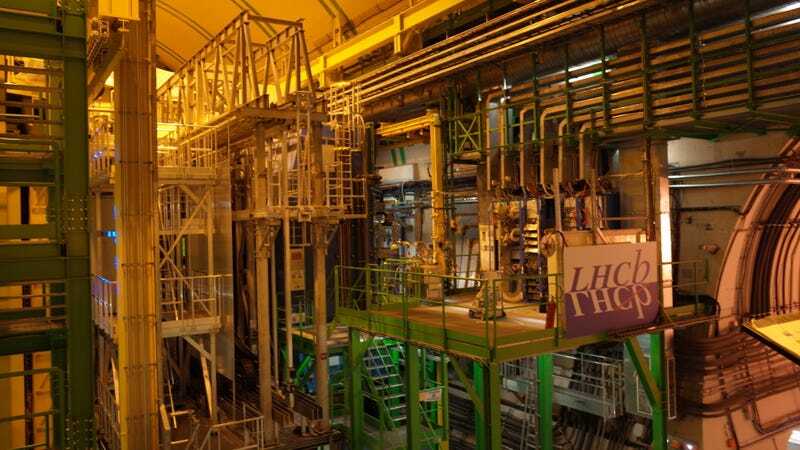 “This one,” the LHCb’s new particle, “had a mass so different than the mass from the SELEX collaboration that it makes their mass unlikely,” said Koppenburg. The new xi particle weighs around 3600 MeV, or four times the mass of the proton. SELEX’s similar-but-different xi particle weighs about 100 MeV less, despite differing in composition only by the very light up or down quarks. None of this stuff is easy. Scientists are looking for incredibly elusive particles that exist for less than a picosecond, or a trillionth of a second. But since they’re moving at nearly the speed of light, they still travel a few millimeters before decaying into particles detected by the trails they leave in the LHCb experiment. 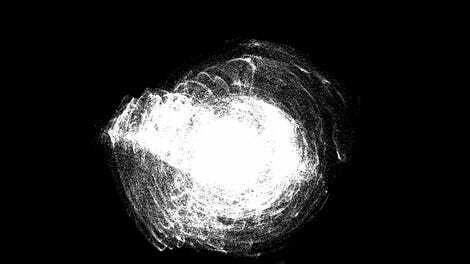 Specific particles can set off a trigger letting the experiment know to keep the data on the event to analyze later. Reconstructing the specific tracks the particles left allows researchers to determine whether they spotted their xi. And that particle must emerge as a signal over all of the background noise caused by other physics and other particles flying through the detector. In this case, the scientists saw a “12-sigma” significance, meaning it’s incredibly unlikely that their observations were random noise that just so happened to look like the new xi particle. Regardless of past results, the LHCb scientists I spoke with pointed out that this new particle will allow them to better understand particle physics in general, and continue refining their theories about what quarks do when they stick together. “We’re understanding that there are more complicated structures in nature than we thought there were before,” Sheldon Stone, Syracuse University physicist, told Gizmodo. This new xi particle can’t really exist on Earth except for in experiments, but probably existed right after the Big Bang when things were a lot hotter and closer together. Understanding the ways quarks could arrange themselves might offer further insights into the physics of that primordial era. And while disproving a theory is exciting, this new xi seems to have the mass theorists expected, said Stone. Update 9/11/17: The LHCb Collaboration published the paper detailing the discovery today in the journal Physical Review Letters.